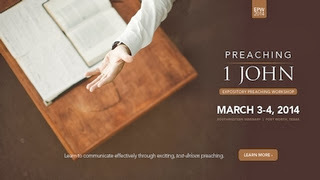 Those already starting to make plans for next year might be interested in the 2014 Expository Preaching Workshop to be held at Southwestern Baptist Theological Seminary on March 3-4, 2014. The workshop will run from 4:00-9:00 pm on Monday and 8:00 am-4:00 pm on Tuesday. The cost is $25 for students and $50 for non-students. The focus of this year's conference will be on 1 John. You can access more information here.